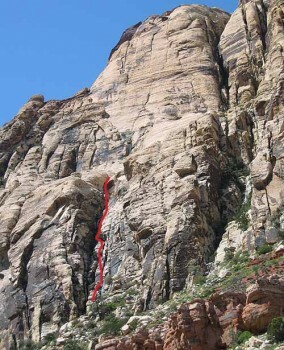 Solar Slab Gully is one of the easiest multi-pitch climbs at Red Rocks. With abundant bolted anchors, short pitches, and with an easy approach, it is extremely popular. However, it is all chimney and gully climbing and even with a low rating, many climbers are not experienced at such climbing. It is a fine mountaineering and canyoneering adventure, but is not up to the quality and exposure of most moderate Red Rocks climbs. Which SuperTopo guidebooks include a topo for Solar Slab Gully?